Opt-in email broadcast services are projected to grow significantly over the next few years. A few early entrants, such as DoubleClick, SilverPop and Expedite, dominated the marketplace. When Captaris/MediaLinq services entered the email broadcast space, they not only had to quickly establish the company as price competitive, but also argue that they offer significant feature enhancements which make the job of broadcasting email easier — and more responsive. We took the approach of creating a series of white papers. They discussed true tactical challenges to generating better response to email — and how Captaris MediaLinq’s service solves those challenges. The result was better response rates. Furthermore, we offered these white papers in a series of email campaigns targeted at marketing managers. 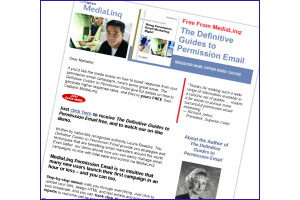 Interestingly, these email campaigns have led to a significant percentage of respondents who have opted-in to receive MediaLinq’s e-newsletters. The newsletters offered tips and techniques to achieving better email marketing results. The perception is that MediaLinq is “the place” to go for better information and service.